The historic , to the east, was in operation between 1905 and 1940. 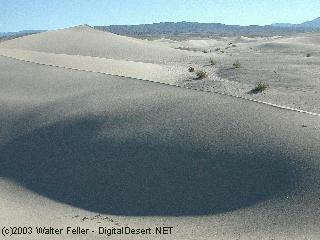 The vegetation here consists of creosote scrub, some annual grasses, and wildflowers in the spring. 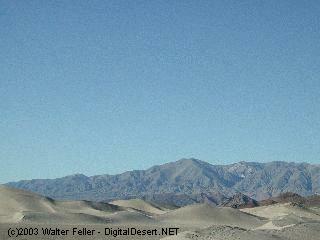 The low elevation in the area makes for warm to extremely hot conditions in spring and summer. Early spring wildflower displays in this vicinity can be quite impressive. 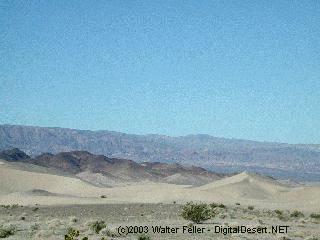 The riding area is south of the Amargosa River and east of Highway 127, about 31 miles north of Baker, California. There are two ways of getting to the dunes. The Little Dunes staging and camping area is directly off Highway 127, conveniently located for immediate staging. One mile north of here, just off Highway 127, is Dumont Road, a dirt road which follows and crosses the river, leading to the main field of large dunes. 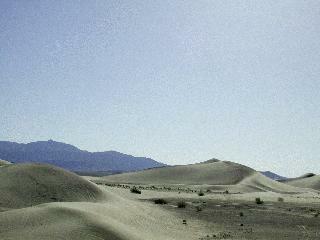 Most visitors ride motorcycles or ATVs, sand rails, or tour the area in vehicles with four-wheel-drive. 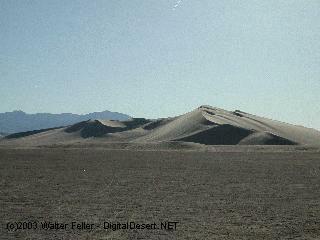 The area off Dumont Road is used extensively for OHV and sand rail staging and play. There are many opportunities for hiking, rock scrambling, rockhounding, and bird, and wildlife-watching in the hills away from the dunes. 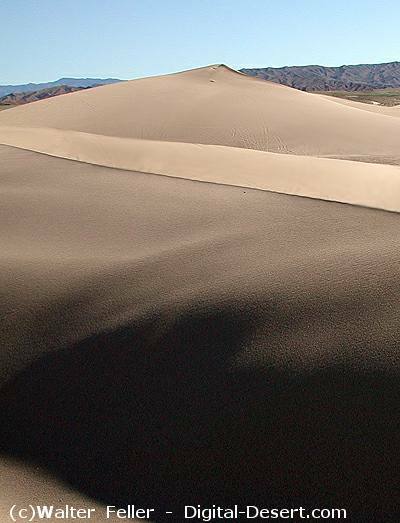 The Dumont Dunes Off-Highway Vehicle Area consists of several riding opportunities. 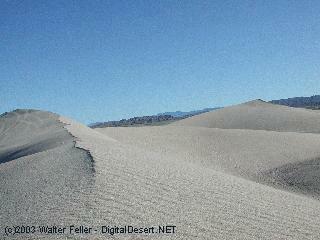 The Dumont “Little” Dunes is a favorite place for families with smaller children. The dune field is more forgiving to riders with novice to intermediate skill levels and those who wish to practice in a safer environment. 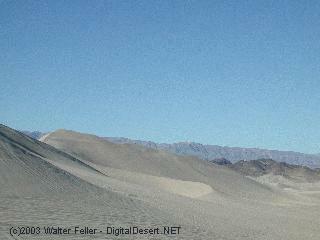 This small low dune field is connected to the main Dumont dune field by a corridor and is there to allow all types of off-road vehicles to legally access the two dune fields. 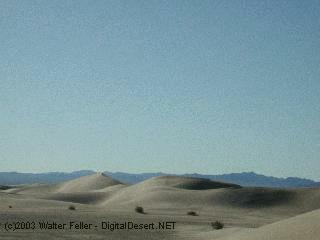 The main dune field is Dumont Dunes. 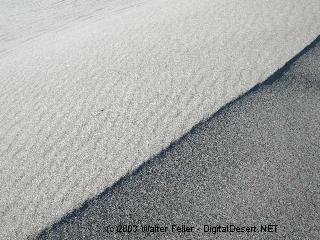 This field consists of steep dunes with sharp razor backs ande deep witches eyes and should be traversed by experienced dune riders. 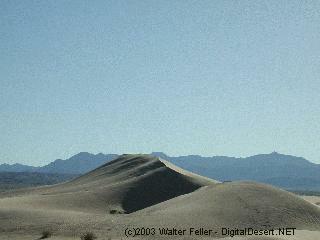 Riders should always do a check ride to find changes in the dune field before attempting a high speed run. The back side of the dunes around the race track is an excellent place for novice and intermediate riders to traverse a multitude of dunes that approximate their skill level. 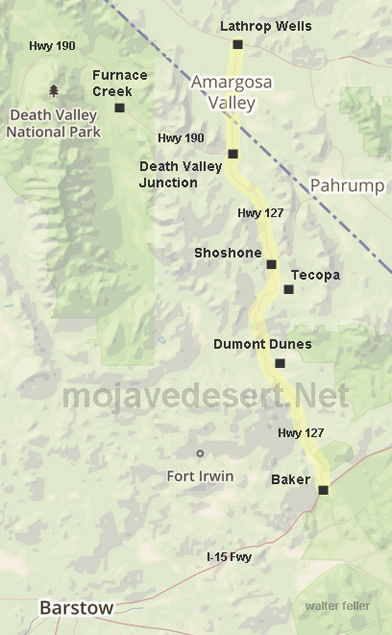 There several areas around the dune fields that are within the boundary of the off-highway Vehicle Area and will challenge the novice and intermediate riders on terrain other than sand The Sperry Wash Route is an open “limited use” route that travels up the Amargosa River to Sperry Wash. This route travels over some extremely rocky and rutted terrain but is a good challenge for the novice to intermediate rider. This route is limited use and straying from the marked route is prohibited. The Kingston Range Wilderness borders the riding area to the north. This area is closed to motor vehicles. Travel outside the riding area to the south and east is permitted only on designated routes and only with street-legal vehicles. Extremes of heat and cold are common. Emergency help is not immediate.